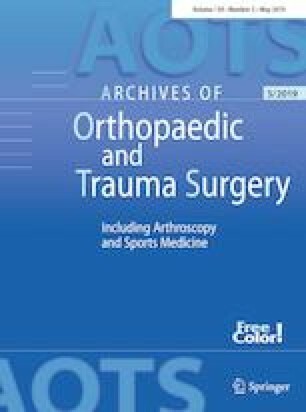 The aim of this study was to evaluate a radiographic measurement method for assessment of overlengthening of the MoPyC radial head prosthesis. Seven cadaver specimens were studied in ten stages: native specimen (1), radial head resection (2), and implantation of the MoPyC radial head prostheses (Bioprofile, Tornier, Montbonnot-Saint-Martin, France) in four increasing length (correct length, overlengthening of 1.5 mm, 3 mm, and 5 mm) with an intact medial collateral ligament (MCL 3–6) and following transection of the MCL (7–10). The radiographic measurement method according to Athwal et al. was evaluated to detect overlengthening. Statistical analysis included calculation of the diagnostic accuracy of the radiographic method. The radiographic measurement method correctly determined the size of the radial head prosthesis within ± 1 mm in 224 of 336 scenarios (67%) and within ± 2 mm in 320 of 336 scenarios (95%). With a threshold value of ≥ 1 mm, the overall diagnostic sensitivity for detecting overlengthening when it was present and was 90% and the specificity was 79%. The sensitivity was higher with increasing size of the prosthesis: in cases with overlengthening of 1.5 mm, the sensitivity was 76%, with an overlengthening of 3 mm, the sensitivity was 95%, and with an overlengthening of 5 mm, the sensitivity was 100%. The radiographic measurement method of Athwal et al. can be used to estimate and to diagnose the magnitude overlengthening of the MoPyC radial head prosthesis. However, the sensitivity is limited (76%) in cases with a small amount of overlengthening of 1.5 mm. The authors thank Prof. Friedrich Anderhuber for the donation of the seven adult upper limbs from the Department of Anatomy of the Medical University of Graz under the approval of the Anatomical Donation Program of the University of Graz. We are also grateful to Wright/Tornier for the gift of the radial head prostheses for the cadaver study. The radial head prostheses for this cadaver study were provided by Fa. Wright/Medical. No company had any input into the study design, protocol, testing, data analysis, or manuscript preparation. The authors, their immediate families, and any research foundations with which they are affiliated have not received any financial payments or other benefits from any commercial entity related to the subject of this article. Ethical Committee Approval was obtained: no. 837.297.17(11131).